One of the most interesting series of cards to come about was the Stadium cards that affected each player’s side of the board in different ways. Sadly though there were only three of these kinds of cards printed – Parallel City, Reverse Valley, and Chaos Tower. Chaos Tower didn’t really do a whole lot, simply preventing each side of the board from specific Status Conditions, and Reverse Valley was really only good in a couple of decks at its best and was generally useless otherwise, but Parallel City did something the other two didn’t, and that’s likely the biggest reason that it nearly made the Top 10 List a little while ago. Parallel City has two effects, each of which affects only the player who the card effect is pointing to. Basically there’s a “red” effect and a “blue” effect, and if that color is closer to you, that’s the effect applied to you. The “red” side would decrease the damage coming from Grass, Fire, and Water Pokemon on that player’s side by 20, while the “blue” side would reduce the total number of Bench slots down to 3, with any extras being discarded if the player had more than 3 when it’s played. This blue side was the major factor in Parallel City’s playability, as it proved to not only be a great counter to Sky Field, a Stadium that could give each player upwards of 8 Bench slots, but it also had a lot of utility outside of that. You could play out a hand of Pokemon with powerful support Abilities, and then you could use Parallel City to clean up your Bench and make sure you didn’t have vulnerable Pokemon ready to get KO’d – pretty useful when one of your key playmakers is a Pokemon-EX with only 90 HP! Not to mention against some decks, you could reduce the damage output they had to keep your Pokemon safe for another round. Needless to say, the widespread versatility of Parallel City’s blue effect allowed it to see play in a ton of decks during its lifespan, and it’s possible that in Expanded we’ll see it in some fringe tech play, but for the most part, it hasn’t seen much use for a while, and that’s probably more so because a lot of decks are filling up with space for different kinds of strategies, and it’s not always viable to stick in a Stadium that may or may not get rid of some Pokemon or reduce the damage from an opposing deck. It’ll always have some level of niche play though, and it’s certainly a card to keep an eye on going forward. Arora Notealus: Interestingly enough, when I first reviewed Parallel City back in the Top 10 for BREAKthrough, I speculated on what it would be like to have two positive effects rather than two negative effects on a card. The funny thing is, we see that happen with Reverse Valley – where Metal Pokemon could get their damage reduced while Dark Pokemon get their damage buffed. Turns out though, one of the “negatives” on Parallel City wasn’t as negative as perceived, and it ended up being a lot more useful than Reverse Valley’s two “positive” effects. Not that they were bad in any way, just not as widespread in utility as Parallel City! Side Review – no side reviews for a little while! Between the rotation list, ban week, and a few fringe cards from Forbidden Light, there’s not a whole lot of review material here! Next Time: A little extra charge for a little special something! This week, we look at some cards that just missed from making the top 10 cards lost to rotation ranging from XY Breakthrough to XY Evolutions. The results hasn’t came in it, so we might as well take the opportunity to cover as many cards as we can until the results are finally out. Our 11th place pick is Parallel City, which was ranked by the review crew the best card of XY Breakthrough (https://www.pojo.com/COTD/2015/Nov/252.shtml) due to being the first Stadium card that has two different effects depending on which side that you’ve played. If you choose the City side, then your Grass, Fire, and Water Pokemon do 20 less damage, which obviously is not ideal if you’re using such types unless you are still confident that you can still achieve OHKOs or 2HKOs even after the damage reduction. If you choose the Forest side, then your bench size shrinks down to three. While that may forcibly take some bench slots away, you can discard damaged Pokémon or ones that already served their purpose such as Shaymin-EX or Tapu Lele-GX, denying your opponent from easily picking them off for easy prize cards. While these effect seem like they’re both passive, it does have some real counter to cards that rely on the quantity of Benched Pokemon, especially if Sky Field was online before being replaced with Parallel City. Whereas Mega Rayquaza EX’s Emerald Break attack will suffer due to having less Benched Pokemon, now Zoroark-GX’s Riotous Beating suffers as well. As such, Parallel City is more than just being used for whatever reason, it also cripples your opponent setup to some extent. The damage reduction isn’t really a counter per se, but it helps soften certain attacks as long as the correct side of this Stadium card is intact. This week, it is a bit early to dive into SM – Celestial Storm, so we’re taking time to look at some of the cards that didn’t quite make our recent Top 10 Countdown of Cards Lost to Rotation. I’d put the year in there to clarify, but the rotation that happens September 1, 2018, is referred to as the “2019” rotation on the official Pokémon website, which is so confusing it seems simpler to include this clunky sentence of explanation. We’re beginning the week with a twofer because we were unable to post any reviews yesterday. I’m running late with those reviews, so I’ll have to give the same spiel tomorrow. Officially, we begin the week with what would have been our 11th place finisher, Parallel City (XY – BREAKthrough 145/162) earned 58 voting points by appearing on two out of three personal lists, and was my seventh place pick. Parallel City is a Trainer-Stadium that applies one of two different effects to a player based on how it is facing when it is put into play. The effects are written so that whichever appears to be right side up is the effect that applies to you, though the rest of the card text (name, non-effect text, etc.) will only appear right side up from one direction. 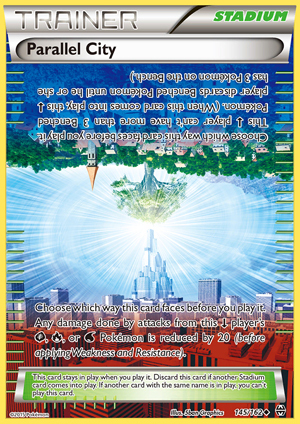 The effect text that fits a normal card layout, appearing right side up when the name also is right side up, states any damage done by attacks from your [G], [R], or [W] Pokémon is reduced by 20 before applying Weakness or Resistance. The other side restricts that player’s Bench to just three Pokémon, forcing him or her to discard any in excess of that. In general, Stadium cards wax and wane in importance not only due to their own effect(s) but because players may only play one Stadium per turn and there can only be a single Stadium in play at a time, and you cannot play a copy of a Stadium card that is already in play. This has added relevance thanks to differentiated effects on players. Normally, if both players run the same Stadium, you don’t care which player’s copy is on the field, but if you are hit with the opposite effect of Parallel City which you wanted, you can’t use your own copy to discard it. Getting to the merits of the actual effects, damage reducing varies from meaningless to critical, depending on what a player is running. Obviously, if you’re not running [G], [R], or [W] attackers, this side does bother you. However, even if you are, it still might not matter, or at least not matter much. You might have attackers of multiple types, so you just have to rely a little more heavily on those not effect. Even if ALL your attackers are having their damage reduced, it only matters if the -20 shifts how many turns it takes you to score a KO or somehow causes certain effects to trigger (or trigger more often). Even then, things could be weird: take Vespiquen (XY – Ancient Origins 10/98), a [G] Type Stage one famous for its “Bee Revenge” attack that only needed [CC] to do 20 damage, plus another 10 for each Pokémon in your discard pile. Sometimes the -20 prevented a crucial OHKO for Bee Revenge, other times Bee Revenge was already in overkill territory or the deck could discard two more Pokémon, play a Muscle Band, etc. and get the job done. Of course, those extra resources required may or may not matter as well; this could get very complex! Vespiquen brings us to a drawback of the other effect, but before I get to that, let me explain that capping your opponent’s Bench at three Pokémon is the reason this is one of the best Stadium cards currently available in the Standard Format, and in Expanded it takes things like Dimension Valley to rival it. This can force your opponent to discard valuable Bench-sitters and/or spare attackers, and prevent them from not only dropping those but Pokémon with useful coming-into-play effects, like Tapu Lele-GX. So that drawback I mentioned? Your opponent MIGHT have Pokémon he or she wants to discard from play, like a spent Tapu Lele-GX, an injured attacker that some Bench damage or a Guzma (plus attack) will finish off, or that discarding will help with certain effects and that brings us to Vespiqeun. As a reminder, I am focusing on this older card not because it is the current BDIF in Expanded – I was surprised it did alright at the last major Expanded tournament – but because its Typing, attacks, and how it is used help demonstrate the pros and cons of Parallel City. Vespiquen decks themselves sometimes ran (run?) Parallel City, willingly taking a -20 to their own damage to cripple an opponent’s Bench or using it to discard Pokémon from their own bench to fuel Bee Revenge and/or get rid of juicy targets like spent Tapu Lele-GX or Shaymin-EX (XY – Roaring Skies 77/108, 106/108). One last layer of complexity to discuss, however, now that we understand how Parallel City works and how it sometimes can backfire. All Stadium cards, barring the not-yet-released Prism Star Stadium cards that have built-in protection against this; we’ve got not one but two easy-to-run Trainer cards that can punish a player’s Stadium usage. Delinquent costs your Supporter-usage for the turn but then forces your opponent to discard three cards of his or her choice from hand. That’s another way to get rid of a Stadium without having to use one of your own, and sometimes you really just want to try and wreck an opponent’s hand, in which case your opponent saved you having to (possibly) play and discard your own Stadium just to fuel the effect of Delinquent. Even more relevant is Field Blower, an Item that allows that player to discard up to two cards from the field, cards that can be either Tools or Stadiums. There are some effects that can help out Stadium cards, but most haven’t proven useful in the majority of decks, so I’ll let you look them up on your own. Another thing that slightly diminishes Parallel City is that we have an alternative means of reducing your opponent’s Bench size: Sudowoodo (SM – Guardians Rising 66/145). You’re giving up one of your own Bench spots, but Sudowoodo has an Ability (Roadblock) that caps your opponent’s maximum Bench size at four unless another effect would restrict them even more. So, there isn’t any benefit to having both Parallel City (correctly positioned) and Sudowoodo on your Bench; your opponent would still be restricted to a Bench of three. HOWEVER, if Sky Field is in play while you have Sudowoodo on your Bench, you still enjoy a Bench of up to eight Pokémon while your opponent can’t have more than four! This means you counter Sky Field without having to win a “Stadium war”. Even with Sudowoodo in the format – and it won’t be rotating this September – and even counters for Stadium cards and even with other Stadium cards that might rival using Parallel City in a deck (we aren’t even going to discuss them; just know that they exist), Parallel City is a strong card that a lot of us are going to miss. Or celebrate its rotation. Or even some of both. Parallel City (BKT 145) debuted in the card game on November 4th, 2015 and has seen sporadic usage over the almost three years that it has been in the format. Although the red side could reduce the damage done by an opponent, this card was almost exclusively played with the blue side facing your opponent because it caused your opponent to limit his bench size to three Pokemon. Sometimes this would be beneficial – Tapu Lele GX’s or injured Pokemon could be shuffled off the board and later recovered by Super Rod or Rescue Stretcher – but for many archetypes, seeing Parallel City come down with that blue side facing you was a gut punch that could completely ruin your strategy for the game. But it did see inconsistent usage because its effective was … inconsistent. Buzzwole was minimally affected by bench size, Yveltal EX Garbodor decks were fairly indifferent to Parallel City, and, as I mentioned, sometimes you just couldn’t play it because it would only benefit your opponent by clearing damaged Pokemon and single use ability bench sitters out of play. Between May 19 and June 23, 39% of top finishing decks ran Parallel City, and those decks that carried it averaged 1.76 copies per decklist. It was the second most popular Stadium card behind Brooklet Hill, and it accounted for 37% of all Stadiums played (which tells you how impactful Stadiums are in the current format… we could use a couple more good, creative ideas for those). Against the right deck, Parallel City was devastating. You could even occasionally Parallel yourself and use the blue side to your own benefit. Overall, however, this card didn’t see a whole lot of play and much of the time was simply Ultra Ball fodder.